A speed limiter fitted to a heavy vehicle in NSW (other than a road train) prevents that vehicle from exceeding what speed limit? A speed limiter fitted to a heavy vehicle in NSW (other than a road train) prevents that vehicle from exceeding what speed limit? Speed limit signs are always a black number inside a red circle. 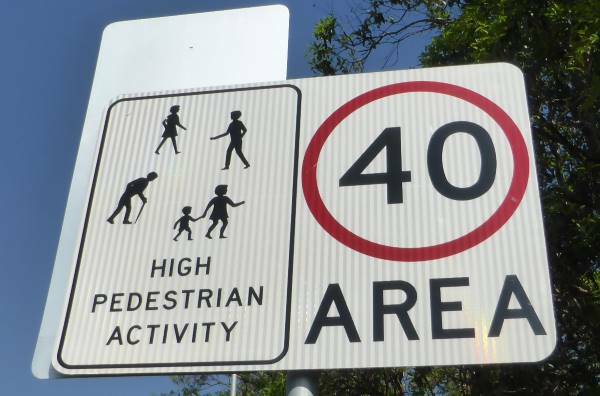 In New South Wales the speed limits range from 10kph to 110kph in 10kph increments, but the majority of roads will either be 50kph in urban areas, 100kph in rural areas or 110kph on motorways and freeways. Other territories have different speed limits (up to 130kph in Northern Territory) and different tolerances for exceeding the limit. Within shared pedestrian zones the speed limit is as low as 10kph. Companies and individuals may place speed limit signs on their own property as low as 5kph, but these are not enforced by police or traffic authorities. 50kph is the default urban speed limit in built-up areas. It may be signposted if unclear, but if a road has street lights and is urban in the absence of other posted limits it will be 50kph. It may be signposted if unclear. 60kph is the limit on significant urban undivided arterial roads (with direct driveway accesses), divided roads with high volume where the lanes are narrow (less than 3.0 metres), and rural residential roads in villages with minimal development. 80kph is the limit on urban high standard divided roads (generally without driveway access), undivided arterial and sub-arterial roads on the fringes of urban areas and lower quality rural roads, undivided rural roads with less than 5.6 metres wide sealed pavement or no marked dividing line. 100kph is the default rural speed limit and default speed limit for non-built-up areas – urban motorways (freeways/tollways), rural undivided road with sealed pavement wider than 5.6 metres, rural divided roads. west of the Newell Highway. Roadworks have speed limits of 40, 60 or 80kph depending on the road and the type of works. Seasonal zones can have different limits depending on the season (e.g. because of weather conditions or tourist numbers). Advisory speeds at corners are not speed limits. They are to advise that a certain speed is a safe speed in dry weather. Other heavy vehicles (i.e. a vehicle with a GVM of over 4.5 tonnes, including B doubles): 100 kph (may have a speed limiter fitted). Some classes of vehicle will be restricted in certain areas while other vehicles don’t have that restriction. The image above shows that trucks and buses are restricted to 40kph in this zone. Cars and motorbikes are exempt from the restriction and the standard or posted speed limit for that area will apply (for example 50kph). Exceeding the speed limit by any speed is technically against the law and you can be fined even if you are doing 1kph over the limit. However, some tolerance is allowed for common sense purposes: there is some variation in speedometer accuracy, a new set of tyres will read a lower speed than a worn set because of the greater circumference, drivers of different heights have a different view of the speedo needle, and it’s not beneficial to encourage drivers to be looking at their speedometer all the time as it means their eyes are diverted from the road. If you are driving sensibly for the conditions with an appropriate gap to the vehicle in front then it’s unlikely you will stopped and ticketed for a coupe of kilometers per hour over the limit. There is an undisclosed margin that you are allowed to exceed the limit by. This is sometimes said to be 10% yet at other times 3 or 5kph. The best way to get an accurate speed reading is to use a GPS. In reality, all new cars are set to under-read. I.e. if your speedo says you are doing 100kph you are more likely doing around 97kph. This is so that manufacturers avoid multiple law suits from people who thought they were driving within the limit but then get a ticket.